I have always felt strongly about the benefits of using sign language in the elementary music classroom, and over the years it has become a regular part of my teaching, especially in the younger grades. 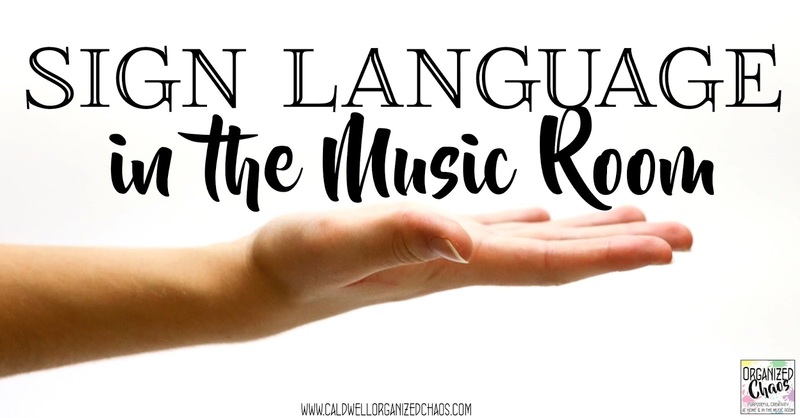 Today I want to talk a little about why and how I use sign language in my music teaching, along with some resources to help you get started with sign language in your own classroom. I taught in international schools for the first 6 years of my teaching career, so I developed strategies early on for teaching language through music (since so many of my students were second language learners). This was initially my primary reason for incorporating sign language into my teaching- by using sign language along with the words when learning a new song, more students were able to grasp and retain the meaning of the words and learn new vocabulary. I quickly realized, however, that using sign language was benefitting all of my students- not just the second language learners! First, there is the obvious benefit of including movement to keep kids actively engaged and involve kinesthetic learning. But I've found that using actual sign language, and not just generic motions, makes a huge difference in learning. The key I think is that with sign language, each word/phrase/concept has a unique gesture, so students can attach meaning to the motion through the word and vice versa, to better remember the music and better understand new songs when they recognize a familiar sign. There have been many instances when students would figure out the meaning of a difficult word in a song because it was a synonym of another word they had sung before and they remembered the gesture/sign. And because the gestures in sign language are designed to communicate the meaning of each word or idea, most of the signs make sense to kids and provides another way for students to understand a word or concept (besides having me bumble through a verbal explanation myself). I've also found it so helpful to include sign language for any performance songs I do with younger students, particularly up through 2nd or 3rd grade. By having students sing all of their songs with sign language, they are better able to follow my conducting, control their bodies and behavior on stage, and communicate the message of the piece more clearly. If you've ever tried to conduct a group of kindergarteners, you know that it's very hard to get them to stop mirroring your conducting motions- the more focused they are on following you, the more likely they are to move their arms right along with you! With sign language, I can sign along with them rather than using traditional conducting gestures to keep everyone together. Having meaningful movements to do also helps keep those jittery little bodies engaged and controlled on the stage, and no matter how excited or nervous they get, the sign language also helps to communicate the meaning and message of the words to the audience as well. Especially with younger students, signing every word is going to be next to impossible and counterproductive. Choose just the most important words to sign so that the gestures flow together easily and line up with the music more readily. For example, when my students sang, "I Want a Hippopotamus for Christmas", they did the sign for the words I, hippopotamus, and Christmas. Depending on how fast the words are being sung, you'll be able to adjust how many words you sign. Much as I like to stick to the "real deal" as much as I can, some signs are just too intricate for little hands, or take too long to complete. In those cases I've learned that it's OK to simplify things a little. The more you practice the signs, the more easily you'll be able to think of ways to simplify a particular sign without losing the meaning. If you watch people signing fluently, you'll notice that different people will sign slightly differently, just like different people speak with different accents. Just do your best to use whatever your modified version is consistently any time you have the same word or idea in other songs. It may be time consuming at first, but besides all of the benefits to student learning I've already mentioned, using *actual* sign language gives you the side benefit of learning a new language yourself! If you want to use ASL (American Sign Language), the site ASL Pro is awesome for learning new signs. Not only do they have videos for each word so you can see someone signing them, but you can actually rewind, pause, or slow down the video so you can practice it! If you happen to need a word that they don't have on that site (which has only happened a couple of times in my years of using it), do a google search for "(insert word) in ASL sign video" and you're sure to find something. If you're wanting to use another sign language, search for "(insert name of sign language) video dictionary" and see what you can find- there are many free ones available online. Another benefit of using sign language to teach a new song is that you can have students follow along with you as they listen to you sing it by mirroring your motions/signs (I do everything left handed so they can more easily mirror me). This is a great way to get them listening and paying attention to the words before they start trying to sing! I have them mirror me as best they can while I sing it the first time, then I show them and have them practice any of the more difficult signs separately until they can sign the whole song with my singing, then I teach them the singing (which by that point takes no time at all because they've heard me sing it several times!). Do you use sign language in your music classes? What are your favorite tips for incorporating sign language, and what have you found to be the benefits of using it? I'd love to hear your thoughts in the comments below! I use the sign language with my kids. We use the sign language for lyrics but we also I have ABCDEFG in sign language up on the walls in my room. This helps with student comprehension. When I ask a class what note this is on the staff, they ALL show me with their hands. :) I love it! I would love to hear more about your experience! I have been teaching a small group of nonverbal students (integrated with another class) for the first time this year and I have picked up several new signs that the teachers and paras use with them that I now use with both those students and the other kids!